Yoga, an ancient practice and meditation, has become increasingly popular in today’s busy society. For many people, yoga provides a retreat from their chaotic and busy lives. This is true whether you’re practicing downward facing dog posture on a mat in your bedroom, in an ashram in India or even in New York City’s Times Square. 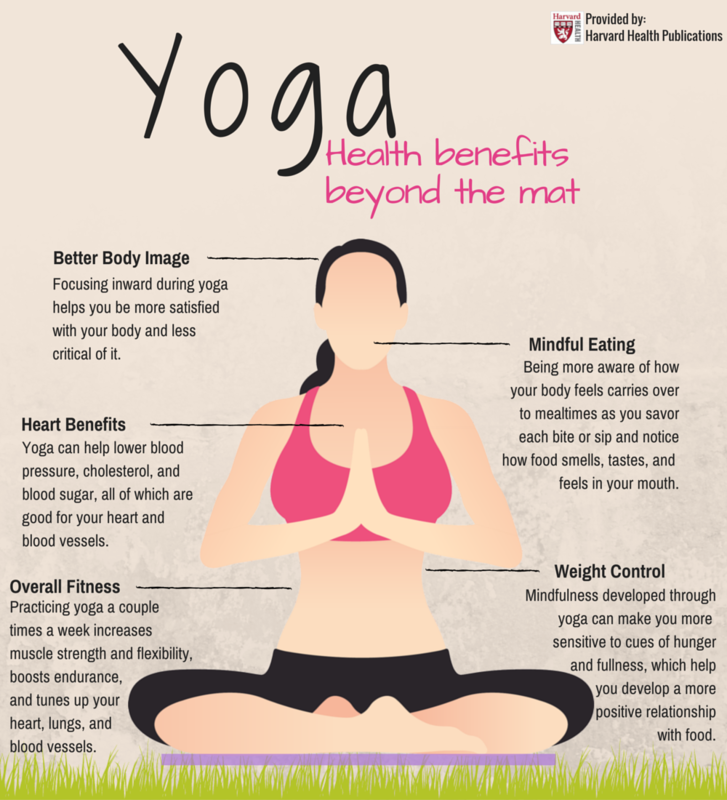 Yoga provides many other mental and physical benefits. Some of these extend to the kitchen table. There are many types of yoga. Hatha (a combination of many styles) is one of the most popular styles. It is a more physical type of yoga rather than a still, meditative form. Hatha yoga focuses on pranayamas (breath-controlled exercises). These are followed by a series ofasanas (yoga postures), which end with savasana(a resting period). The goal during yoga practice is to challenge yourself physically, but not to feel overwhelmed. At this “edge,” the focus is on your breath while your mind is accepting and calm. Yoga develops inner awareness. It focuses your attention on your body’s abilities at the present moment. It helps develop breath and strength of mind and body. It’s not about physical appearance. Yoga studios typically don’t have mirrors. This is so people can focus their awareness inward rather than how a pose — or the people around them — looks. Surveys have found that those who practiced yoga were more aware of their bodies than people who didn’t practice yoga. They were also more satisfied with and less critical of their bodies. For these reasons, yoga has become an integral part in the treatment of eating disorders and programs that promote positive body image and self-esteem. Mindfulness refers to focusing your attention on what you are experiencing in the present moment without judging yourself. Practicing yoga has been shown to increase mindfulness not just in class, but in other areas of a person’s life. The researchers found that people who practiced yoga were more mindful eaters according to their scores. Both years of yoga practice and number of minutes of practice per week were associated with better mindful eating scores. Practicing yoga helps you be more aware how your body feels. This heightened awareness can carry over to mealtime as you savor each bite or sip, and note how food smells, tastes and feels in you mouth. People who practice yoga and are mindful eaters are more in tune with their bodies. They may be more sensitive to hunger cues and feelings of fullness. Researchers found that people who practiced yoga for at least 30 minutes once a week for at least four years, gained less weight during middle adulthood. People who were overweight actually lost weight. Overall, those who practiced yoga had lower body mass indexes (BMIs) compared with those who did not practice yoga. Researchers attributed this to mindfulness. Mindful eating can lead to a more positive relationship with food and eating. Yoga is known for its ability to soothe tension and anxiety in the mind and body. But it can also have an impact on a person’s exercise capacity. Researchers studied a small group of sedentary individuals who had not practiced yoga before. After eight weeks of practicing yoga at least twice a week for a total of 180 minutes, participants had greater muscle strength and endurance, flexibility and cardio-respiratory fitness. Several small studies have found yoga to have a positive effect on cardiovascular risk factors: It helped lower blood pressure in people who have hypertension. It’s likely that the yoga restores “baroreceptor sensitivity.” This helps the body senses imbalances in blood pressure and maintain balance. Another study found that practicing yoga improved lipid profiles in healthy patients as well as patients with known coronary artery disease. It also lowered excessive blood sugar levels in people with non-insulin dependent diabetes and reduced their need for medications. Yoga is now being included in many cardiac rehabilitation programs due to its cardiovascular and stress-relieving benefits. Before you start a new exercise program, be sure to check with your doctor. Researchers are also studying if yoga can help people with depression and arthritis, and improve survival from cancer. Yoga may help bring calm and mindfulness to your busy life. Find registered yoga teachers (RYT) and studios (RYS) through The Yoga Alliance.